NEW YORK CITY — Get ready for $112 monthly MetroCards and $2.50 single rides. The MTA board voted unanimously to hike fares on Wednesday, less than 24 hours after news broke that board Chairman Joseph Lhota would be stepping down to run for mayor. Under the plan, which will go into effect March 1, single bus and subway rides will jump 25 cents, from $2.25 to $2.50 a swipe. Thirty-day unlimited MetroCards will jump from $104 to $112 and 7-day passes will rise from $29 to $30. The MTA also voted to reduce the automatic bonus on pay-per-ride cards from a 7 percent bump to a 5 percent bump. However, the bonuses will now kick in on purchases as low at $5, instead of the current $10. To bring in extra cash, the MTA will also begin to implement an already-approved plan to charge $1 for every new MetroCard purchased. 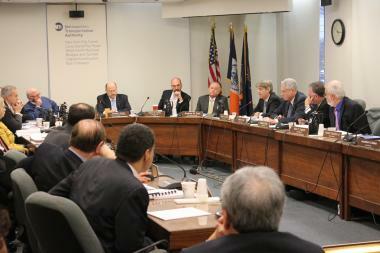 The MTA votes to raise subway and bus fares and bridge and tunnel tolls in Wed., Dec. 19, 2012. The fee, which is expected to bring in an extra $20 million a year, will not apply to straphangers who hang onto their existing cards or whose cards are damaged by wear and tear, Lhota said. Drivers who use the MTA's bridges and tunnels will also be forced to pay more, with the tolls on most crossings rising from $4.80 to $5.33 for E-ZPass holders, and from $6.50 to $7.50 for riders paying cash. That means a round trip over the Robert F. Kennedy and Throgs Neck bridges or through the Queens-Midtown or Brooklyn-Battery tunnels will now cost $15 in cash. The non-resident toll for the Verrazano-Narrows Bridge is set to rise to from $9.60 to $10.66 for E-ZPass users and from $13 to $15 cash, but will be less for residents who use the bridge three or more times a month. For those residents, each trip will cost $6, compared to $6.36 for infrequent users. Long Island Rail Road and the Metro-North tickets will also rise by about 8 to 9 percent, depending on the type of ticket and travel zone. Board members said the plan, which is intended to raise $450 million in new revenue, was the best option for the cash-strapped agency, which is deeply in debt. The board had considered other fare hike combinations, including plans that would have boosted weekly unlimited cards far higher and eliminated bonuses. But after a series of public hearings, members said they tried to minimize the burden on frequent users and poorer riders, who rely on 30-day MetroCards and automatic bonuses. "What you have before you, I think, is the best of a not-so-great situation," said board member Andrew Albert before casting his vote to adopt the plan. He said that, "in a perfect world, we would not be going through these increases every year," but said that a lack of funding from the state and federal governments leaves the agency on precarious financial footing. Still, he warned that fares are reaching the point where taking public transit will no longer be viable for low-income families already struggling to pay the bills. Board member Mitchell Pally, who represents Suffolk County, said the vote marked a "sad day" for the board, but that the money had to come from somewhere. "This board is left with only one option," he said. But residents and elected officials fumed about the impact the hikes would have, especially on Staten Island. Rep. Michael Grimm, who represents parts of Brooklyn and Staten Island, called the Verrazano Bridge toll hike an "outrage" and warned it would hurt Staten Island's economy and slow hurricane recovery efforts. "The MTA board has made it crystal clear that we are nothing more to them than an ATM machine to pay for its complete inability to work within a budget," he said in a statement. "As the families and businesses of Staten Island struggle to rebuild and recover from Superstorm Sandy, this toll hike is just another blow to a borough that has already been knocked down."